This was the very first photo that I listed on Etsy. I listed it on April 17, 2012. It’s gotten lots of views and little hearts. 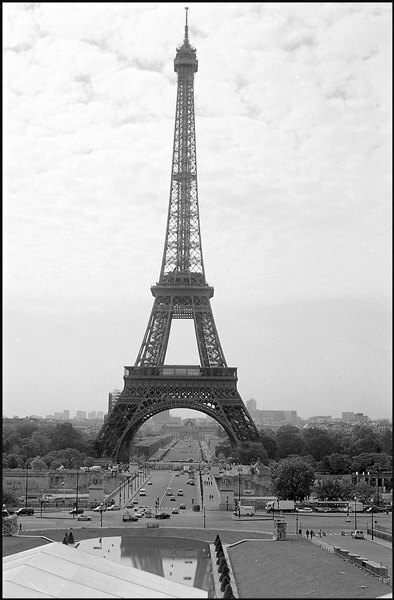 It’s a nice retro style photo of the Eiffel Tower. It’s originally a color negative that’s been scanned and converted to black and white. My sister and I went to London and Paris in May 2002. The weather in London was rainy and cold. And Paris was a little better, but still chilly. I drove my sister mad with my camera and my need to nap. But I got some fantastic photos. We were on a tour when I took this photo. There was some discussion about going up into the Tower. But thankfully, time was short and we weren’t able to go. I’m not a fan of great heights. Also, if you have ever been to any tourist destination where you may have to go up or down, they put 50 million people into one tiny elevator. It’s disturbing to me. But I would have gone just to not have to explain to my more adventurous sibling why I wouldn’t be going up into the Eiffel Tower.